Amish Dress Hat - Flat Top - Colonial Trading Co. These hats are the absolute highest quality black fur felt Amish hats. They are made for the Amish by the Amish and are what they wear for any formal occasion (church, weddings, funerals, etc). 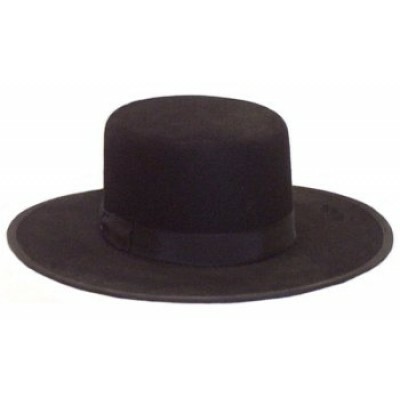 The Amish maker does not market his hats outside of the Amish community. The hat has a 1 1/2" leather band on the inside. Dimensions: 4 1/2" High with 3 1/2" Rim. Other sizes or brim dimensions may be available upon request.. NOTE: The size is the average diameter. To calculate your size, measure the circumference of your head, and divide by 3.14 (Pi). This will give you your size. For instance, a size 7 1/4 will fit a head that measures 22 3/4" around.